This fine card game has been revived by the expansion/independent game 'Sole Mio' and advanced rules. In it’s original form this was a kind of inverse Bohnanza. 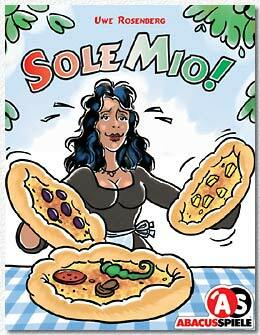 Players play ingredients and recipe cards on a pile, hoping that the cards below their recipe (after all card plays the tile is reversed) will be enough to fulfill the pizza recipe. Some recipes work, some don’t, and one can never be sure as remembering the actual ingredients in the pile is very difficult. The expansion adds some very odd recipes with partly complicated rules, and the possibility to “help” other players with finishing their recipe – for the price of finishing one of your own recipes for free. The odd recipes make the game more chaotic and unforeseeable, the “helping” options make the game more tactical. All in all this is a good and fun mix of ingredients, and the game was very well received in our group and has been on the table often recently.